A luxury brand built upon the idea of creating beautifully constructed shoes, Stuart Weitzman’s main objective has always been to merge fashion and function. For more than 30 years, Stuart Weitzman has been synonymous with expert craftsmanship and innovative design. Today, the brand is undergoing a global multi-category accessories expansion with the goal of designing dynamic shoes, handbags and jewelry for every woman for every occasion. Stuart Weitzman is a global leader in designer footwear and operates over 100 retail stores across North America, Europe and Mainland China. The boot is a cornerstone of the Stuart Weitzman DNA – as Stuart is, after all, the King of Boots – the extreme thigh-high LEGGYLADY returns, reimagined in lush velvet. This new must-have is finished with a SW signature tie back detail for a flawless fit. Day-to-night drama takes shape in the STRAIGHTEN. 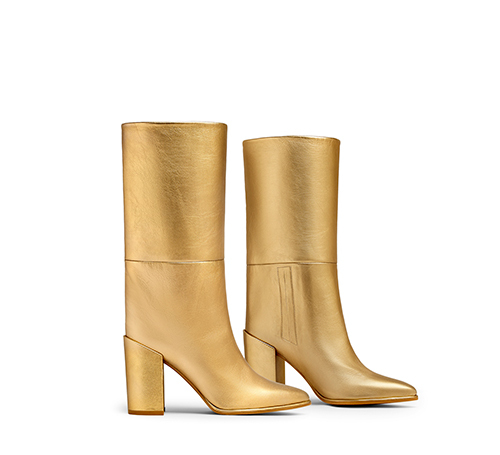 The mid-calf masterpiece is crafted from a soft-hued metallic gold leather and sets the stage for unconventional excellence: its structured shaft, which was designed to skim the calf, is paired with a strong block heel and a pointed toe for a leg-lengthening effect.